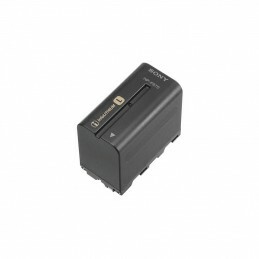 The Sony NP-F970 L Series battery pack is designed specifically for use with select Sony camcorders. But for sound mixers, it can be used for the Sound Devices 7-Series Audio Recorders and PIX Video Recorders. Carry a spare and enjoy up to 12 hours of continuous recording time (battery life will vary with usage, and temperature). And rechargeables like this one don't lose their capacity when partially charged or discharged, so you can freshen up this battery whenever it's convenient. Part of Sony's AccuPower system, InfoLithium batteries include a built-in microprocessor that communicates with Handycam® models. The AccuPower Battery Meter, a highly sophisticated power management feature that constantly monitors shooting conditions, displays the minutes of remaining battery time in the corner of your viewfinder or color LCD screen. It takes the guesswork out of figuring out when to change batteries. Super-long battery life: The NP-F970 has an estimated life of 720 minutes (12 hours). The battery life is based on continuous recording at 75° F for Sony camcorders with the LCD screen off and 4.0W power consumption. This is only an approximation and will vary based on actual power consumption of the component being used, manner of usage and temperature.